13AM Games, the developers behind Runbow, have returned with Double Cross, a colorful puzzle-platformer starring Zahra, an agent of R.I.F.T. (Regulators of Interdimensional Frontiers and Technology). She uses her powers to move between dimensions and fight enemies in order to restore peace, while investigating the culprit behind an attack on RIFT headquarters. 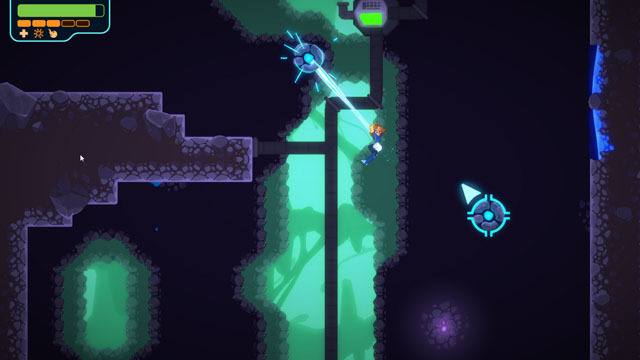 She has a Proton Slinger that lets her fling herself between grapple points to zip around the environment, but she can also grab objects out of the air and toss them, allowing her to take down obstacles and enemies. Over the course of her adventure, Zahra travels between worlds taking on challenges unique to each area while collecting a substance called Upgradium (hmm...) that allows her to unlock new abilities. The game is now available for PC via Steam and Humble Store, and Switch via eShop. Check our coverage here.